Camp Conquest (www.campconquest.com) is a Christ-centered, week-long, overnight camp for children and adults with special needs and disabilities. The camp is located and held in Memphis, TN, situated on 94 rolling acres with a lake, 12 cabins (heated and air conditioned), large dining room, zip line, high rope swing, lake slide, horseback riding, pool and much more. You can see what it’s like to ride a high rope swing or 3 story lake slide on our website. Ages 15-30 to be a counselor to a camper for a week. Counselors live in the cabins with their campers. The campers and counselors experience all of the activities at camp together. Ages 30-60 to be a cabin mom or dad to help counselors during the week of camp. 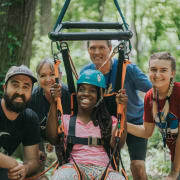 You don't need experience since we provide 2 days of training before campers arrive and you will be with other counselors and cabin leaders who have experience working at camp. Volunteers pay $95 to cover the cost of lodging and meals for the week.